Lee Cohen is currently one of the best ski photographers, and his images just might be some of the most iconic of all time. Watch this video to get a glimpse of his daily ski photography routine and to hear of his motivations. Cohen is one of my favorite photographers. On top of having a great eye for and athletic ability to shoot in steep terrain and deep snow, his overall attitude and energy for the sport and image-making never seem to go down, even as his age goes up. Cohen first visited the famous ski resort in Utah — Alta — in the winter of 1978-79. While traveling and living as a ski bum in the Wasatch, Cohen was immediately infatuated by Utah's famous fluffy snow and great light. According to the video, Cohen first started shooting images during the record-breaking winter of 1983-84. 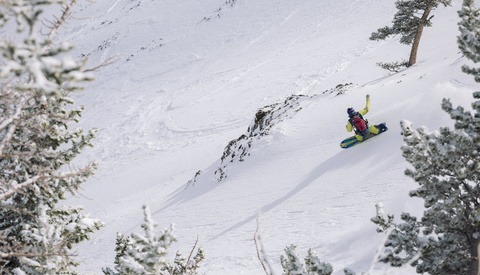 "We were skiing super deep blower pow constantly," said Cohen. "We wanted to capture the experience... I would just take my camera with me every day. It was a small setup, a Nikon F3." Decades after first shooting at Alta, Cohen has now established himself as one of the most highly regarded ski photographers in the world. To honor Cohen's achievements and creative drive, earlier this year, Powder magazine published a seven-page editorial featuring the photographer and his journey to success. Additionally, Alta and Powder magazine recently polled the country to determine the best ski photo ever taken at Alta. One of Cohen's images from 2005 tied for first. In addition to having his images land on the front cover of various winter sports publications, Cohen published a book titled "Alta Magic," which features a collection of his breath-taking images. Watch the above video from AltaSkiArea to hear more of Cohen's photographic journey and how it has come full circle. Leave a comment below regarding what you like about the photographer's work. Very cool thanks for sharing. Lee is a great guy and an amazing shooter. FYI I got third, or maybe fourth, in that "Best Alta shot Published" dealio. I used to think I wanted to be a "ski photographer." But I wasn't all that great at skiing, and dindn't like the cold so much. It took me awhile to realize that, to excel at photography, you really have to have a deep connection to what you're photographing. And it's great to see a photographer who has just that.